This year, I think I have seen more articles on why and how NOT to make New Year’s Resolutions than making them. I’m not sure what this says about us, or about such resolutions, but, never one to miss an opportunity to make a nice list, I have made some mediation-specific resolutions nonetheless. First of these (unfortunately a perennial on) is to practice reflective practice more. Despite knowing how valuable it is, and constantly telling my students how essential it is, reflective practice can often take the form of getting home as quickly as possible, kicking off my shoes, pouring a glass of wine and thinking “I wish I hadn’t said that”. The resolution for this year therefore is to take even 15-20 minutes after a mediation (or teaching) before I leave to pick one or two learning points from the day or session and reflect on them. For me, it is critical to do this in writing, as this embeds the learning better and also provides a useful resource to go through at a later date, when stuck or when preparing for a mediation. I have also resolved to take this one step further and will look back on work I did on identifying my constellation of theories, are suggested by Michael Lang (The Making of a Mediator). It is beyond time to re-visit and update my constellation map, and perhaps expand it to include some of the learning from last year. Of course, in engaging in reflective practice, I will also be resolving to remember that it’s not all about me. Reflective practice can, if not carried out with compassion for ourselves, become a vehicle for self-criticism, can feed into a tendency for perfectionism and thus lead to an exaggerated sense of responsibility for outcomes. This is turn can lead to further navel gazing and forgetting who the mediation is really about – the parties. I am resolving to remind myself, as I’m sure many mediators need to, that even when I do everything “right” parties may still not reach resolution. Even if I ask the right questions at the right time, the time might not be right for agreement. We do of course play an important role in the process, but must remember that it is not nearly as important as those of the parties. On a cheerier note, a new year is always a good time to think about acquiring some new skills. With an increasing focus (in Ireland anyway) on continuing professional development, I have my eye on a number of conferences and workshops, on topics such as conflict coaching and new developments in online mediation. 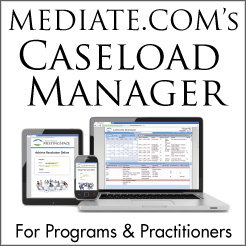 With the advances in online education, and dedicated mediation education platforms such as www.mediatoracademy.com, advanced learning in mediation and conflict management is easier than ever to access so there’s no excuse! Along similar lines, I have identified a few people in the field I would like to learn from or exchange ideas with and will arrange to meet with or talk to them, before everyone’s diaries get too full. Never underestimate the learning that can come from fellow professionals who are struggling with the same challenges, maybe in different contexts or different jurisdictions. These resolutions are all (at least potentially!) inspiring and mind expanding. But practical matters must be tackled too. At least once a year I try to overhaul all mediation documents – my Mediation Agreement, various templates, intake forms and information sheets and policies. I have noticed that these become leaner with each overhaul, that is, more user friendly and less full of jargon. A Mediation Agreement for family mediation which used to run to 4.5 pages now just about fills two. It still contains all the necessary information and clauses, but much more succinctly. I also try to ensure I update any references to legislation, which means that this year might see a second revision of documents if the long-awaited Mediation Bill is published, as indicated, in the next few weeks. Mediation agreements are often taken for granted, until we find we need to enforce our fees, or rely on a mediator’s privilege or confidentiality clause. Ensuring such agreements are correctly and effectively drafted is therefore essential. And then, of course, there is the matter of filing…which I am not going to go into as it’s too boring to write about even for me but a note of caution – don’t take the security promises of cloud storage options for granted when storing sensitive data…. Finally, of course, we should all be resolving to continue to spread the word and raise awareness of mediation, to support our students studying and researching conflict, to remind our clients why it is a better way, and most of all to continue to believe that little by little, it is possible to change the way we approach conflict and disputes. According to all those articles about how (not) to make New Year’s Resolutions, apparently it is important to share our goals to ensure we are accountable for ensuring we achieve them. I reckon I have that box ticked anyway. Anyone else?